Concealer is a type of cosmetic used to mask spots, blemishes, and dark under-eye circles. 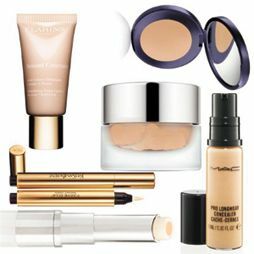 Dark under-eye circles are unattractive, but can be easily fixed or covered with a little concealer magic. Apply the concealer, starting next to the bridge of your nose, to your outer eye. Be sure to evenly cover all dark areas under your eye with the concealer. If youâre not applying the concealer straight from its container/stick, the use of a brush is also helpful. With a make-up brush or sponge, blend the concealer until the under-eye area is smooth and seamless. Gently soften the edges by blending up and out for a natural look.